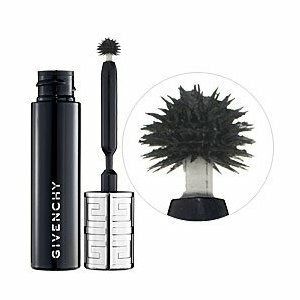 I find this Givenchy Phenomen Eyes Mascara quite interesting. The ball shaped wand is a unique design, it is supposed to reach every lash and adapt to all eye shapes. Phenomen Eyes Mascara is designed to hold the curl of the lash and leave them evenly spread for a "panoramic effect", says Givenchy. Miss L. Chin says Phenomen is the "Holy Grail" of mascara's. Many ladies from makeupalley.com think this mascara is fabulous. It lengthens, separates each lash and also manages to reach even the tinniest lashes. Many users also like the very dark black color. There are some people that aren't so happy with the results of this Givenchy mascara. Cosmonautte from makeupalley.com thinks there is a default in the formula as it takes ages to dry. Quite a few girls have had trouble using the wand and say it leaves smudges. Water, Paraffin, Cera Alba (Beeswax), Polybutene, Styrene/Acrylates/Ammonium Methacrylate Copolymer, Bis-Diglyceryl Polyacyladipate-2, Palmitic Acid, Stearic Acid, Triethanolamine, VP/Eicosene Copolymer, Acacia Senegal (Acacia Senegal Gum), Hydroxyethylcellulo Phenoxyethanol, Glycerin, Panthenol, Butylene Glycol, Tetrasodium Edta, Sodium Laureth-12 Sulfate, Sodium Lauryl Sulfate, Tocopheryl Acetate, Disodium, Cetyl Phenyl Ether Disulfonate, Potassium Sorbate, Methylparaben, Propylparaben, Edta, Butylparaben, Ethylparaben, Isobutylparaben, BHT, CI 77266 (Black 2), CI 77499 (Iron Oxides). Phenomen Eyes Mascara by Givenchy retails for $28 and comes in black or brown. Yet another very expensive mascara on the market. You are currently browsing the archives for the Givenchy category.